I’m pretty impressed with Grand Rapids these days. 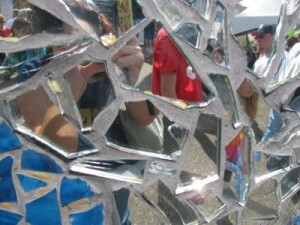 Right now, for the first time a competition called ArtPrize is taking place and I cannot remember if I have ever seen the streets so filled with people – people so excited about their town, people so excited about ART. I’ve been out twice to check out the art – and I have barely scratched the surface of all there is to see out there. There are some exhibits we’ve seen twice (Pumpkin is particularly enthralled with Nessie – the “Loch Ness Monster” that is placed in the river). 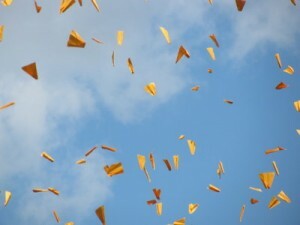 Yesterday, we happened downtown at just the right time to see 100,000 Paper Airplanes over Monroe Avenue. This was an event/exhibit that was talked about ahead of time – but sadly, I had about three days of newspaper outside that I hadn’t yet brought into the house (But I still subscribe even if I don’t always read it – so, yay me?). There’s a bit of something for everyone – there’s interactive art – there are sculptures – there are awesome things being made with recycled glass – there are things that make you smile – things that make you think. I have LOVED taking my children and watching them enjoy art – watching them get excited about the next thing. Watching the look on Pumpkin’s face as she gives something a thorough look, or a smile spreading across The Princess’s face when she sees a sculpture that pleases her. Thursday Ten: Finger Picking Good Edition? 1. So, still working on finger-picking skills in guitar this week. “Dust in the Wind” is still heavy in the rotation – it’s actually a pretty good starting point, even though quite frankly, I’m sick to death of the song. Good news is that today I am branching out! Yes. Next song? Tracy Chapman’s “Fast Car”. Finger-picking (for those who might not know) is when you pick the strings with your right hand versus strumming). “Fast Car” has one pattern for most of the song – so if I can just get that down, I’ve pretty much got the whole song. WHOO! 2. A week from tomorrow is the rehearsal dinner for my sister’s wedding. This is the home stretch, y’all. I AM SO SICK OF THIS WEDDING ALREADY. When I got married, we paid for pretty much everything which, having seen this drama unfold, I am SO grateful for. When other people aren’t shelling out their money, they aren’t as free to shell out their opinions. The opinions will getcha every time. 3. In a moment of total frustration the other night – after hearing about how someone in the groom’s family had completely stomped my sister’s opinions AND feelings again – I wrote my speech for the MOH toast. Felt the need to show my sister some love – when she’s not been gettin’ much of it through this process. 4. New music this week – a friend of mine fed my music library again (I so love when she does that). Some Nadia Ali, Pixie Lott, and Harry Connick, Jr. I’m not sure about the HCJ – I don’t love it… but then again, the album seems to be mostly covers of standards, and that’s been done. SO done. 6. Grey’s comes back tonight… and it’s two hours tonight. And this is when I kick myself for not having DVR, because I’ll have to miss Project Runway and yes… these are totally first world problems. 7. 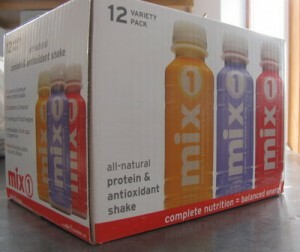 Last week-ish, I purchased a MIX 1 Antioxidant protein drink. I love Mix 1 drinks – this particular one, however was… not quite right. I wrote them an email and they kindly replied to me explaining the problem with the high-fiber antioxidant drink was something that they are currently working on. They sent me some drinks to thank me for my email, and I can’t tell you how excited I am by that. I LOVE THESE THINGS. I buy these frequently – they’re great for when you’re on the go – and they count for your fruit/veggie servings too and I think these peeps are awesome for explaining to me what was going on with the other drinks on production and why it wasn’t 100% yet. The flavors I buy most often are Lime or Mango (Hubby’s partial to Blueberry Vanilla). I already loved these people – their customer service makes me love ’em more. And I can’t wait til they get the other ones right – I’ll definitely try ’em out. 8. Last night was Back-To-School Night at The Princess’s school. I’d been concerned because the spelling test she brought home last week was a ball of crazy (CAB, BUS, MUD??). The teacher clarified and explained the logic and I am feelin’ a bit better about things now. My concern with The Princess in school always is – Is she gonna be bored? Sounds like her teacher really has a good feel for trying to get to each child’s level so that they may be challenged and pushed to their potential. That makes me VERY HAPPY. 9. As some of you know, for my 101 List I am re-reading some “classics”. I am admitting defeat with “The Count of Monte Cristo”. I HATE IT. In six months, I haven’t even read 40 pages (I’ve still managed to read over 40 BOOKS though). What should I read in its stead and does anyone want a very gently used copy of “TCOMC”? 10. I had to get all my pre-yearly-physical blood work done last week for my upcoming doctor’s appointment. The lab results were mailed to me. My cholesterol? It is LOW. As in below the reference “normal” range. I’d like my gold star, please. An Owner’s Guide To Ears: Don’t Put Little Stuff In ‘Em. See that little thing on my hand? It was too far in to just flick out with a finger. It wasn’t going to fall out on its own. I called the afterhours number – and within minutes a nurse was on the phone with me telling me that we had to either get it out or bring her into the emergency room. In the mean time, Hubby called a neighbor who happens to be a physician’s assistant and asked if he could come over and take a peek in her ear. The PA graciously said he’d be right over (Awesome, right?). The nurse recommended tipping Pumpkin so the ear with the bead was facing the floor. She then said to wiggle the ear around in hopes that the movement plus gravity would get it out. IT WORKED. Minutes later, the PA showed up with his handy-dandy tool kit — fortunately, we didn’t require his help…this time. I have no doubt in my mind that we should probably put the guy on speed dial, though. Just in case. I learned a very important lesson this weekend. The lesson? My sister chose me to be her Maid of Awesome (or MOH for you traditionalists) for a reason – because really, there was no one better suited to stand up for her on her big day. No one has known her as long, and perhaps no one knows her as well. I thought I was doing her a favor letting her friend plan the party – letting someone younger take the reins. 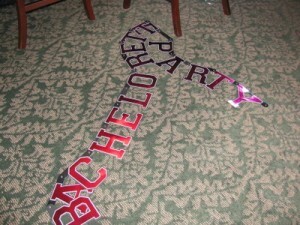 I mean, shucks – it’s been awhile since I went to a bachelorette party. Of course, the last one I went to involved going to a dueling pianos bar and I loved the whole thing (and it’s what I would have done had I carried through with planning Saturday’s event) – I just wanted my sister to have a good time. I relinquished control… and I never do that. 1. DON’T forget to consider what kind of party the bride would want. If she’s not crazy about walking around with a plastic phallus around her neck, maybe you should reconsider those accessories. She’s not a “hit the dance floor and dance all night” kind of girl? Maybe you shouldn’t pick THAT PARTICULAR BAR. If the bride would be happier hanging around someone’s living room, sharing a few drinks, opening gifts, and laughing about old times: THROW HER THAT KIND OF PARTY. 2. DON’T up the skeeze factor. Sure, it’s her “last night out” – but attempting to send her on a scavenger hunt to kiss strangers and take pictures of random “butts of hot boys”? Some people are into that. Your bride might not be. OUR BRIDE WAS NOT. 3. DON’T expect the bride to pay her way. Or yours. The bride really shouldn’t have to bring more than her ID and her lipgloss (or whatevs) for her night out. Not sayin’ the planner needs to foot the entire bill – if you don’t have a ton of cash, plan a low key night – OR get the other party-goers to chip in a few bucks to pay the bride’s way. Usually, if you keep your party plans in line with your budget – it’s NOT a problem. But if you start crying poor in the middle of the evening so that the bride pulls our her wallet to pay your cover into yet another bar where the bride does not wish to go, the odds are pretty high that the bride’s sister (AKA MAID OF AWESOME) will get very upset with you. When all was said and done, my sister’s friend had planned a party that she, not my sister, would enjoy. My sister had a miserable time – made even MORE miserable when her friend hit her up for half of the over-priced hotel that she’d booked for the party. The night I’d have planned for my sister probably would have cost somewhere in the neighborhood of $40 – 50 for me (versus the $400 this one seemed to morph into), and she would have had more fun. Bigger is not necessarily better. Sometimes less is more. And if it’s the thought that counts, you should be thinking of the right person. P.S. I’m so glad all the showers and parties are done. We’re in the home stretch now. 1. Yes, still working on “Dust in the Wind”. I actually had to YouTube it last week because I’m just not THAT familiar with the song. For others of you who may be to embarrassed to admit you don’t know the song either… Here ya go. Actually, I’ve improved a lot from last year – but you’ll listen and the guitar part? That’s WAY speedier than I play. Just so ya know. 2. This morning when I dropped off Pumpkin at school, the teacher handed me a paper saying that I owed a balance of sixty-some bucks. HUH? I went home, read the transactions listed and realized that they missed crediting a payment to our account (They didn’t miss cashing the check, however – that cleared a week ago). Makes me wonder how many people just pay without doing the research. So, whew – but yeah – just goes to show, it does pay to not just take someone’s word for it and to check your records to see if you have the right information. 3. It’s 3:30 in the afternoon which means it’s just the right time for chocolate milk. I don’t know why. I hate store bought chocolate milk – it’s too thick. I just made a glass with skim milk and sugar-free Hershey’s syrup. Yeah, I’m waiting for the inevitable comment that perhaps I’m doing it wrong. 4. New music this week: More stuff from Glee. Two Eddie Vedder songs from the movie “Into The Wild.” Not a whole lot of new music – I keep forgetting, actually, to buy new stuff. 5. Let’s go back to GLEE, shall we? Seriously, the funniest thing I’ve seen on television for awhile. I’m definitely hooked, and I think Mr Scheuster is adorable. Especially when dancing. The 90s flashbacks with Color Me Badd and Bell BivDeVoe were major earworms last night though. Not that that’s entirely a bad thing. 6. PROJECT RUNWAY NIGHT. I’m undecided what I think of the switch to Lifetime – it’s hard to tell because they’ve also switched to Los Angeles versus NYC, and that’s a whole ‘nother vibe change there, as well. Tonight’s episode is supposed to be some big deal – and I won’t even care if I watch and find out it’s not really a big deal because I love it that much (Oh shush. Some of you with your “Mad Men” – which I’ve never seen – same kind of fascination – just a different outlet for your fanatical television love). Tim Gunn makes me supremely happy – in a dapper, “make it work” kinda way. 7. I recently went on a Douglas Coupland book-reading frenzy. I hadn’t read any of his stuff in awhile and was immediately reminded why I’d always enjoyed it. Some of his writing is LAUGH OUT LOUD FUNNY. Check him out. 8. My sister’s bachelorette party is Saturday. I’m not too involved in the planning and more than a little nervous about the agenda of the evening. Especially because I can’t get any word on what the actual agenda IS. Pro: I’m not planning it, less stress. Con: I’m not planning it, less control. Mom: You’re an Obama fan, right? Me: I support Obama, yes. Mom: Then answer this for me, would ya? Did he really say Kanye West was a jackass? Mom: Oh GOOD! I finally agree with him on something. 10. “Cloudy With a Chance of Meatballs” comes out this weekend. I don’t think I’ve ever even read the book, but I’m debating taking my kids. It looks cute-ish. I like going to the movies, though. May be a nice way to decompress after Saturday’s bachelorette party stress. Pumpkin is fascinated by dinosaurs. She is so fascinated that when we go to the library, we now bypass the kiddie section with the Biscuit board books and make a beeline for the children’s nonfiction section where she prowls the shelves for just the right dinosaur books that she’ll start looking at once we get into the car. 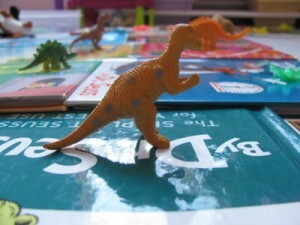 These books contain sometimes graphic depictions of T. Rex’s eating their prey. She doesn’t care. She’s not scared. She knows they’re all dead. She can identify the different types of dinos – not just T Rex and Triceratops… but Stegasaurus. Apotosaurus. Brachiosaurus. Deinochyrus. Cryolophosaurus. (I didn’t look any of those up – the stuff’s sinking in with me too). You never know what is going to catch your kiddo’s fancy. The Princess has actually loved things that are all pretty much things I love: reading, writing, music. Pumpkin’s interests are giving me a learning experience too, and that’s actually kind of cool. These are things I love, blah blah blah – saying it cuz I wanna. These are things I’ve purchased on my own, with my own moohlah, unless stated otherwise. This is a necessity for any road trip. I love the traditional flavor Chex Mix. I don’t like the other kinds. I’m kind of a Chex Mix purist, if you will… But, y’know… I just don’t like it as well when it’s homemade. When I make it, it never tastes right. If you are a champion chex mix maker, let me know what the trick is. Til then, I’ll buy it. Well, hey, this is lookin’ like the snack food edition, isn’t it? I promise I won’t ONLY talk about food. These are super yummy. My kids actually don’t really like these because they are very crunchy, but I do. What I like to do is make a BIIIIIIIG salad and then have a few of these on the side. (See, leafy greens. Whew. I’ve redeemed myself. Kinda?). Also, the cinnamon ones are awesome in cheesecake dip. Cinnamint, please. I am a chain-gum chewer. I chew til my gum loses its flavor, toss that piece out and then get a new one. Wrigley’s oughta love me. Also, sometimes I need two pieces of gum at once – you just need a little extra if you’re gonna blow bubbles. I have crazy, mad love for Sharpies. I always talk myself out of buying that huge package with like a bazillion Sharpies in it – but one of these days… I’m GONNA DO IT. Love these things. (This actually goes for many office supply products – I also have a somewhat irrational love of Post-Its). We are in the homestretch for planning my sister’s wedding – the Big Day is about three weeks away and we’ve got a bachelorette party coming up (I’m a little bit scared about that, to be honest), rehearsals, rehearsal dinner, and today was the third of the THREE bridal showers hosted in my sister’s honor. This shower, hosted by the groom-to-be’s awesome stepsister, was an awesome event held at a beautiful country club. The decor was simple yet festive, the food smelled terrific as we arrived, the centerpieces were potted perennials that my sister could take home and could plant at her new home. Perfection. Minutes before the scheduled start time of the shower, my sister’s heel of her shoe SNAPPED OFF. The heel of her high heels she purchased less than 24 hours prior just snapped right off her shoe. UH OH. Our first thought was, “Break the other heel off” – but the thing you might not realize is that when the heel breaks off a high heel, the front of the shoe curves up – almost like little elfin shoes. Not cute. Well, there were still nails or screws or whatever the shoe people used to hold the heel in place on the shoe – so the heel wouldn’t fit flush to the shoe despite the massive amounts of Super Glue used. The glue started dripping EVERYWHERE and it got a little messy. My mom said to my sister, “Just take off your shoes and go barefoot!” and my sister was appalled. “MOM! This is NOT the kind of place you go barefoot!” I offered to let her wear my shoes – I knew they’d be a smidge big, but hey, I don’t mind going barefoot. Who’d be looking at my feet anyway? She refused. But then the manager of the country club said, “Hey, I’ve got a pair of shoes in my car… let me go get them.” They were little small, but my sister put them on and was able to carry on with her shower. This woman definitely went above and beyond in loaning a basic stranger HER OWN SHOES, but she did it. And really? They were some pretty cute shoes. After the shower, my sister put her broken shoes on and we drove to Target to return them. 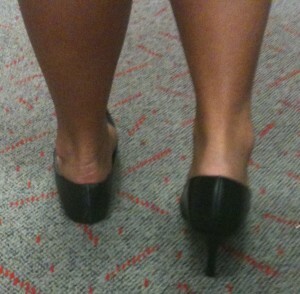 As we walked through Target, she still refused to go barefoot, instead clomping horse-like in her uneven shoes. As we wandered towards the shoes, I could hear the people behind us snickering and we’d turn around and fill ’em in on the weird shoe adventure. 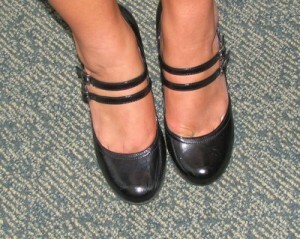 In the end, she actually purchased the same shoes she’d borrowed earlier (in her size, of course). Adorable shoes, $20, Target. Here’s hoping these don’t break. Beyond footware malfunctions, the shower was lovely. The food was great, most of the guests behaved quite nicely, and it was a pretty mellow time. Also, BEST. CUPCAKES. EVER. 365 Days of Pictures. WOW. Thanks, Shutterfly! As most of you know, last Monday I wrapped up day 365 of taking a photograph a day for 365 days. It wasn’t always easy, some of my pictures were pretty boring (I have several snaps of whatever book I was reading on whatever days — not all days are interesting!) but some of my photographs I was (and AM!) tremendously proud of. Midway through the project, I purchased a mini 8 x 8 photo book from Shutterfly, filling it with the photos I felt to be my best to that point. There were pictures of my daughters, pictures of the sunset, pictures of my grandpa. When I received my 8×8 book, I was stunned not only by the quality of the book – but just how much it pleased me to have my photos printed and bound in this pretty little book. 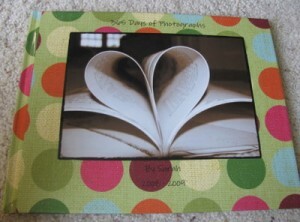 So, I knew that definitely when I completed day 365 I was going to want every day of photographs in a book. 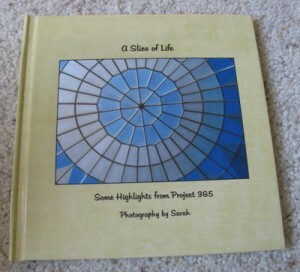 That’s right: ONE BOOK, 365 pictures. A week before the last day, I started compiling my pictures in Shutterfly. The story board format was so incredibly easy to use – I’d choose which pictures I wanted on each page, and then when I was done, Shutterfly would decide the best layout for the photos. If I didn’t like the layout they had chosen, I could select a different one. I was so terribly excited to have all my pictures in one place, and that I’d be receiving them in a book – and then when Shutterfly asked me to do a review, I was glad to – because I was already prepared to buy this book – it was, in fact, already in my shopping cart waiting for me to click “Purchase”. I was already familiar with the ease of use of their photo book system, and the quality of the product. How often do you get the opportunity to talk about a brand you ALREADY LIKE? There are so many cover choices! I chose this funky polka dot pattern because I thought it was fun, and it featured tons of my favorite color (green!). 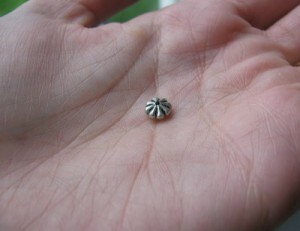 I was able to drop in a cover image (picking this image was difficult – and to be honest, picking one photo out of 365? That was the HARDEST PART OF THE WHOLE THING!). 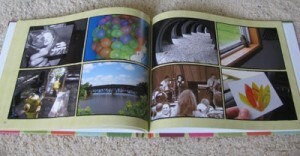 The above is an example of a two page spread – I opted for an 8 x 11 book – and for the most part chose to put four images on each page – and last night, as I flipped through the pages, I was able to watch my year go by, photo by photo and page by page. The little memories I had forgotten about (the bird stuck in my garage, the elephant ear at the homecoming football game, the shortlived flowering season of our rhododendron plant), all on pages for me to treasure forever. 1. Isn’t it fun how you can mosey along and have one average day after another and then get hit with one spectacularly crazy day where one thing after another happens and it’s like, “Dang. ENOUGH.” Yeah. That’s today. Thursday, chill a bit. You don’t have to be such a tough guy. 2. Did you watch “Glee” last night? Did you LOVE it? I watched and loved – but if you missed it, it’s already on Hulu, so you can go get all caught up to see what I was watching last night. Also, I’ve had their cover of “Push It” stuck in my head off and on all day. 3. Nice segue here for new music purchased this week – yes, I’ve bought a few of the GLEE tunes from iTunes. Also, Lily Allen’s version of “Womanizer” (whuuut?). The new Marie’ Digby (it’s very acoustic-y, guitar-y, pop). 5. This evening after my gruesome day, Pumpkin was sitting on my lap. “Tell me what’s in your mouth, you can’t say tongue or teeth.” Hmmm. Gums, I told her. Spit. “Oh! Spit!” And then she promptly spit on my shirt. Awesome. Today is just FILLED WITH AWESOME. 6. Project Runway night. Finally some redemption for the day. 7. I went to my eye doctor today for a yearly checkup. He did a brief exam, left the room so I could put my contacts back in and then came back in three minutes later smelling like cigarette smoke. My appointment continued for another four minutes beyond that. Um. I can’t figure out if he dashed off to sneak a few puffs in the middle of my appointment or if it was from being around a different patient – because he’s NEVER smelled like anything other than normal, light cologne. 8. In guitar today, I started learning about finger picking. The ultimate goal is that I want to play “Fast Car” (I love that song, I just do!) – but we started with Kansas’s “Dust In The Wind“. Admittedly, I’m not familiar enough with this song to have this mean anything to me. So, yeah, there’s that. 9. I hate that Pumpkin doesn’t nap at daycare. That kind of stinks. But in awesomeness, the daycare has started sending home “homework” folders with little handouts for Pumpkin to do – and she feels pretty fancy having big girl homework like The Princess. We’ll see how long her enthusiasm lasts. 10. Sooo, I have to write a speech for my sister’s wedding. Anyone wanna help me?